A sea of crimson Nike dry fit shirts gathered in the center of Seoul. I could see the statue of King Sejong on one side and the mountain peaks lining the clear crisp autumn sky. I couldn’t have imagined a better day for a race. I had originally signed up to be in group C (beginner group). However, Janice, and I decided to sneak into group A(advanced). We heard that group C was really slow and most of the people walked, and it would be hard to get around the walkers. There were 10,000 people in each group! We easily snuck into group A, and as one of the guards there, tried to pull me aside, saying this was only for group A people, I just kept following the crowd of people into the center of the starting place. I noticed that many other people from group B and C had snuck in there too. They led us through stretches and played a bunch of upbeat songs to get us pumped up. The excitement I had from earlier started to quickly drop as I was filled with nerves. What if I couldn’t finish it? What if I started to get bad cramps while running? What if I had to go to the bathroom? All the doubt started to fill my mind, but I tried to stay focused. As the countdown started and I was in the midst of 30,000 people, there was no backing out now. The sound of the gunshot from the screen signaled the start to something I would have to finish, no matter what. I started to run really slowly, as we were still in the midst of a huge crowd, standing almost shoulder to shoulder. We slowly started to pick up our pace as we reached the START line. We started to run. We immediately had to make a right turn and then continued straight. It was pure madness, running in such a huge crowd. I tried to stay next to Janice, but considering how everyone was wearing the same shirt, it was hard to keep track. We continued running passed stopped cars that were unfortunately at the wrong place and wrong time on a Sunday afternoon. People started running to the side of the cones that marked the border for the runners and the oncoming traffic. We continued to run on the left side, trying to avoid the dense crowd of people, after about a km, the crowd grew smaller, as some sped ahead and others slowed down. I felt the inside of my mouth getting extremely dry. I needed water. I would have to wait another 2.5 km until the first water station. I lost Janice in the frenzy of the crowd. I was on my own. As I kept running, I kept telling myself, I will never run in a 10k race again. It was hard running on the streets. I was feeling so tired and I hadn’t even reached 2 km yet. Everyone had told me that you would run faster on race day because of the adrenaline pumping in you. That was a total lie. All I wanted to do was walk. However, I kept telling myself to keep going. The beginning of my run was always the most difficult. As I almost hit 3 km, I slowed down and walked for a bit. However, I knew that I had to keep on going. As I approached the first water station, I immediately grabbed a cup of water. Around 5km, I reached the Mapo bridge that we had to cross. There was a small hill. I didn’t train for any hills! As we crossed the bridge, I knew that I had made it halfway. I was surprised that I hit 5km in about 29 minutes. I must have been running faster than it felt in the beginning. As I continued to run, there were some people cheering on the side, and people in neon green shirts encouraging the runners with high fives and smiles. I just tried to stay focused. I wanted to stop. However, I told myself to keep going. I tried to motivate myself by saying that I would treat myself to buy a really nice bag if I finish the race. It worked. I continued to run. As my nike run application told me that I was on the ninth kilometer, I used up all my energy to sprint towards the finish. Only 100km left the friendly voice told me. Then, I saw the sign. 9km!! The voice on my headphones had just told me I had finished running 10km. How could it be? Who was lying? I had no choice. Everyone else was running. I had to keep going. This was torture. It was suppose to be a 10km race. I continued to remind myself that I was almost done. Just a little more. Finally, the finish line was in sight. As others sprinted ahead, I jogged across the line. 1 hour and 8 minutes. 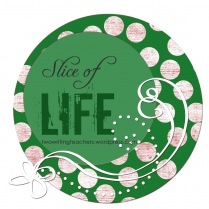 For more slice of life entries go to two writing teachers! Congratulations on finishing the race! I like that you honestly shared how you thought of quitting and how it wasn’t exactly what you had expected. What a story! Congratulations on such an incredible accomplishment! How proud are you? I love the way you told this, especially the thoughts in your head as you ran. WAY TO GO!!!! You made this race come alive – I was rooting for you! Love the happy, triumphant pictures, too. Congratulations! I love your description of the inner narrative going on in your head during the race! Great job!! !